London, October 2017: Three major industry awards ceremonies took place on consecutive Mondays this month, with ASCAP, BMI and BASCA all honouring a host of British and European songwriters, film/TV composers, music publishers and other industry luminaries. Amongst ASCAP's honourees were pop sensation Dua Lipa, acclaimed rock quartet The Amazons and top writer/producer Steve Mac among others. The awards took place at One Marylebone with presentations by ASCAP President Paul Williams, CEO Elizabeth Matthews and UK/European VP Simon Greenaway. Two coveted Vanguard Awards were presented to Dua Lipa and The Amazons, who opened the ceremony with a rousing performance of "Junk Food Forever". Meanwhile Jamaican singer Richie Stephens, whose "Sail Away (Riddim)" was sampled by Barbadian superstar Rihanna on her massive global smash "Work" featuring Drake, received two awards from ASCAP Executive VP John Titta, for Song of the Year and Top Digital Song. The record-breaking song spent nine consecutive weeks at number-one on the Billboard Hot 100 and was named the best song of 2016 in NME"s year-end critics poll. Last year's ASCAP Vanguard Award recipient MNEK returned to the ASCAP stage to accept his award for Top EDM Song. "Never Forget You," a collaboration with Swedish pop princess Zara Larsson reached the top 10 in several countries, including the United Kingdom, Sweden, Denmark and Finland, and became both Larsson and MNEK's first US chart entry. The song is certified 5X Platinum in Sweden and 3X Platinum in the U.S. Pop hitmaker Steve Mac was honored with the prestigious ASCAP Founders Award in recognition of his tremendous work as one of the architects of modern pop music with an incredible 136 hits over the last 27 years. British composer Joby Talbot won Film Score of the Year for his work on the Original Motion Picture Score for Illumination Entertainmentâ€™s "Sing". Other awards presented were in recognition of Hot 100 Songs, EDM Songs, Digital Song, Top Film and Top Television Series. On October 9th BMI honoured musician & songwriter Jay Kay (of Jamiroquai) with the BMI President's Award at the 2017 BMI London Awards. Music industry guests including Naughty Boy, Foals and Bipolar Sunshine filled London's Dorchester Hotel to celebrate UK and European songwriters, producers and publishers of the most-performed songs of 2016. 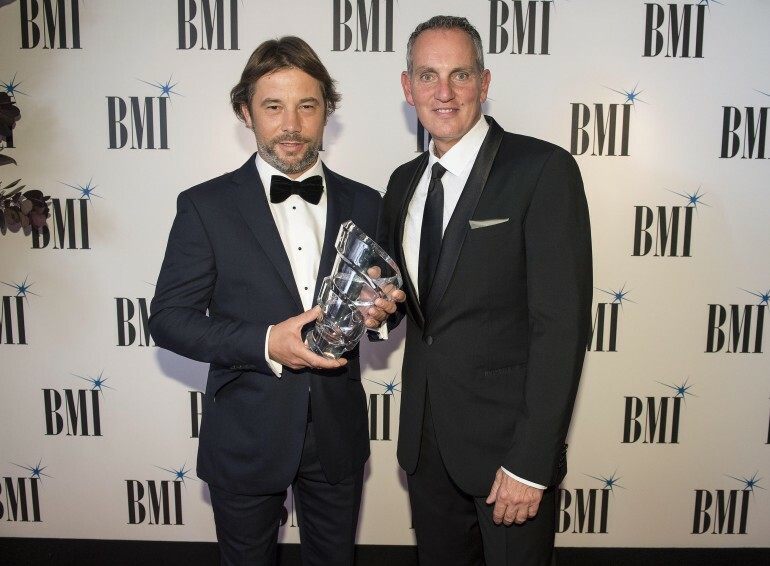 Jay Kay was presented with the prestigious award by BMI President and CEO Mike O'Neill before taking to the stage for an acoustic rendition of "Love Foolosophy" and "Space Cowboy." He thanked his fans, family and all those who supported him over the years, including Jamiroquai founding member and co-writer Toby Smith. BMI also honored Ed Sheeran with the Song of the Year award (The Robert S. Musel Award) for "Love Yourself," as performed by Justin Bieber. Sheeran also received the Song of the Year award in 2016 for "Thinking Out Loud." The Dance Song of The Year was awarded to Jamie Scott, MÃ˜ and Ed Sheeran for "Cold Water," as performed by Major Lazer, Justin Bieber and MÃ˜. Jamie Scott collected the award. Foals received their first ever BMI London Award for 'Mountain At My Gates," and Kyla, Corey Johnson and DJ Paleface were honored for their contribution to Drake's "One Dance," with the song sampling their funky house track "Do You Mind." In addition, Norwegian songwriting duo Espionage, formed of Espen Lind and Amund BjÃ¸rklund, received a BMI Million-Air award for "Irreplaceable" performed by BeyoncÃ©. Fraser T Smith also received a BMI Million-Air award for "Set Fire To The Rain" from Adele's record breaking second album 21. Other artists to be awarded with Million-Air awards include David Bowie, Queen, Eric Clapton and The Police among others. Paulette Long OBE (MD of Westbury Music and Trustee of the PRS Members Benevolent Fund). Maggie Rodford (MD of Air-Edel Group), presented in association with PRS for Music. Emeli SandÃ© MBE (hit singer 7 songwriter), presented in association with PPL. George Vass (chairman of the British Arts Festivals Association). Jon Webster (former MD Virgin records & CEO of the Music Managers Forum.